With this growing awareness, the Chinese government has announced increasing commitments to curtailing the market — with the most recent on Thursday, when the State Forestry Administration imposed an immediate ban on African ivory carving imports to mainland China. The reports summarize surveys conducted in China’s three largest cities — Beijing, Shanghai and Guangzhou — on ivory and rhino horn from November 2012 to November 2014. Findings demonstrate a significant improvement in awareness on how rhino horn and ivory are obtained as well as how the market for such products is devastating elephant and rhino populations while supporting criminal networks in Africa and Asia. The surveys also found that 95 percent of respondents supported an ivory ban, while an equal percentage favored stricter punishments for rhino horn trade offenders. • There was a 51.5 percent increase in those who believed that elephant poaching is a problem: 70.6 percent in 2014 compared to just 46.6 percent in 2012. • The surveys found a 44.8 percent increase in those who believed that elephants were poached for their tusks: 47.8 percent of respondents in 2014 compared to only 33 percent in 2012. Residents believing tusks are obtained only from natural elephant mortality fell from 33.8 percent in 2012 to just 10.5 percent in 2014. • Respondents who believe that rhino horn has medicinal effects dropped by 23.5 percent, from 58.2 percent in 2012 to 44.5 percent in 2014. • 50 percent of respondents believe that horns come from poached rhinos, a 51.5 percent increase in awareness since 2012. • 95 percent of residents surveyed who don’t consume rhino horn agree that the Chinese government should take stricter action to prevent rhino horn consumption, while even 87 percent of rhino horn consumers agree with stricter regulations. 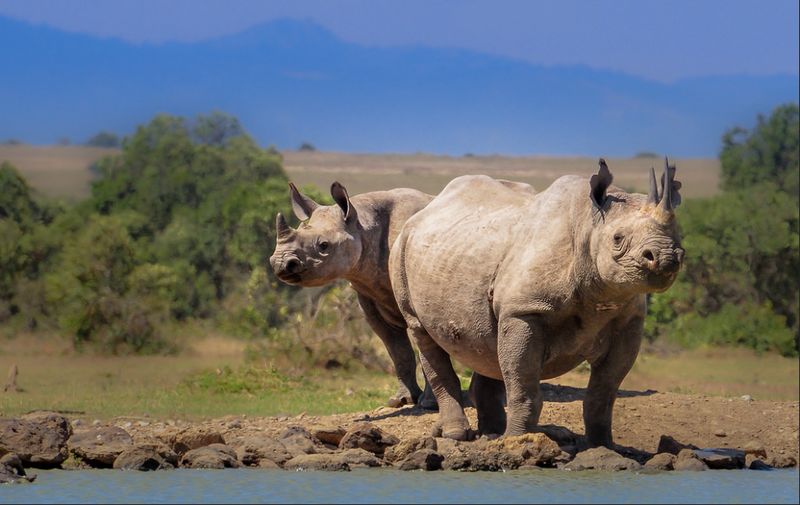 • 90 percent of residents who had viewed the campaign’s public service messages starring Yao Ming or Jackie Chan said they would not buy rhino horn. Following the baseline surveys in 2012, WildAid partnered with the African Wildlife Foundation in early 2013 to launch a public awareness campaign focused on reducing demand for rhino horn. In the same year, Save the Elephants joined the partnership to launch a parallel campaign to reduce the demand for elephant ivory. The campaigns use public service announcements, billboards and subway ads featuring some of China’s biggest celebrities, including former NBA superstar Yao Ming, action hero Jackie Chan and top Chinese actress Li Bingbing, as well as The Duke of Cambridge (Prince William), David Beckham, actor/director Jiang Wen and others. A documentary film featuring Yao Ming about elephant and rhino poaching in Africa was also produced and released in both China and the United States. Media partners in China donated an estimated $90 million last year in pro bono broadcast and media placement for campaign messages. “This poaching crisis was started by increased demand and will only end when it’s reduced. A ban on legal sales of ivory in China already proposed by members of the consultative body at the National People’s Congress is the greatest single step that could be taken for elephants and would clearly be a popular move,” said WildAid CEO Peter Knights. • February 2015: China’s State Forestry Administration announced a one-year suspension of import permits for African ivory carvings. • May 2014: Prime Minister Li Keqiang pledged $10 million in foreign assistance to African countries for wildlife protection and conservation. • April 2014: The Chinese government strengthened a wildlife consumption law by mandating jail sentences for eating or buying products made from the 420 wildlife species considered rare or endangered. • January 2014: The government crushed 6.1 tons of confiscated ivory carvings and tusks. • September 2013: China’s Ministry of Foreign Affairs and its embassy in Nairobi implemented an SMS text alert for all visitors to Kenya from China upon activating their mobile phones requesting that they do not buy ivory, rhino horn or any other wildlife products during their stay. Each year since 2008, the Chinese government has provided up to $200 million in donated broadcast air time and media placement for WildAid’s wildlife conservation messages, constituting the largest wildlife conservation awareness campaign ever. With this extensive media distribution through over 50 outlets, WildAid messages on ivory, rhino horn, shark fin and tigers are resulting in significant increases in public awareness and changing attitudes and behavior, and reduced demand for wildlife products such as the recent decline in consumption of shark fin soup. Iain Douglas-Hamilton, founder of Save the Elephants, said, “China holds the key to the future of Africa’s elephants, and it’s encouraging that those surveyed are increasingly aware that buying ivory kills elephants. Their voices can’t be heard soon enough: 100,000 elephants were killed for their tusks in just three years between 2010 and 2012." About the surveys: The ivory and rhino horn surveys were conducted in November 2012 and November 2014 in Beijing, Shanghai and Guangzhou. The November 2012 surveys polled a sample of 961 urban residents on ivory and a sample of 963 residents on rhino horn. Both follow-up surveys in November 2014 polled a sample of 935 residents on ivory and rhino horn. The margin of error for the samples is plus or minus 1.84 percent.